This is the city that people think of when SoCal is mentioned. 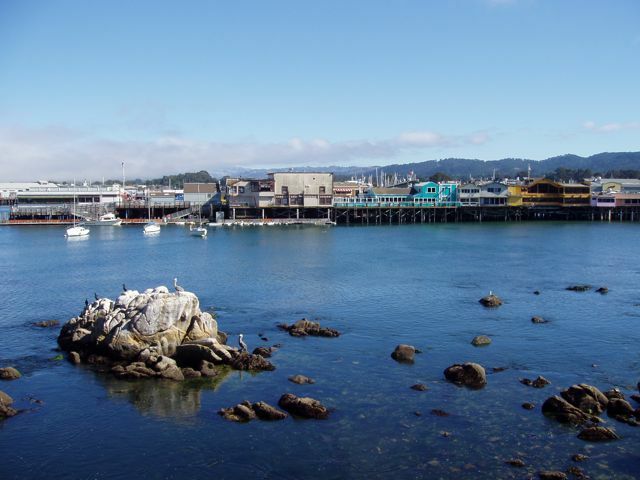 Lying on the coast of California, surrounded by the stunning kelp forests, Monterey has been a playground for over one-hundred years. Still fighting a few problems, we started early on our rounds of Monterey to purchase repair products. 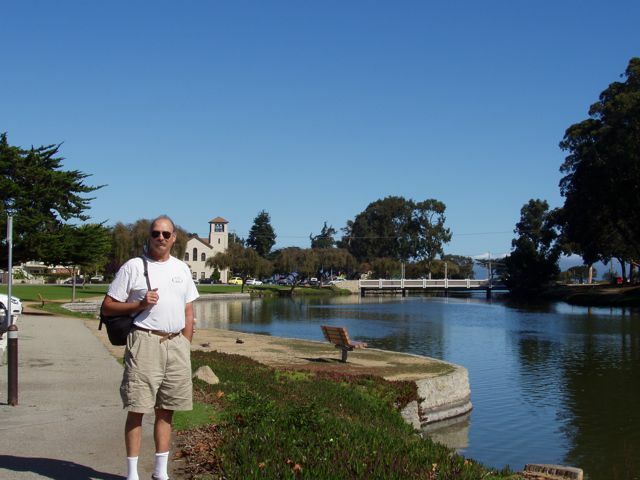 Bill poses beside El Estero lake. The enormous U-shaped lake is home to migrating Canada geese and local wildfowl. 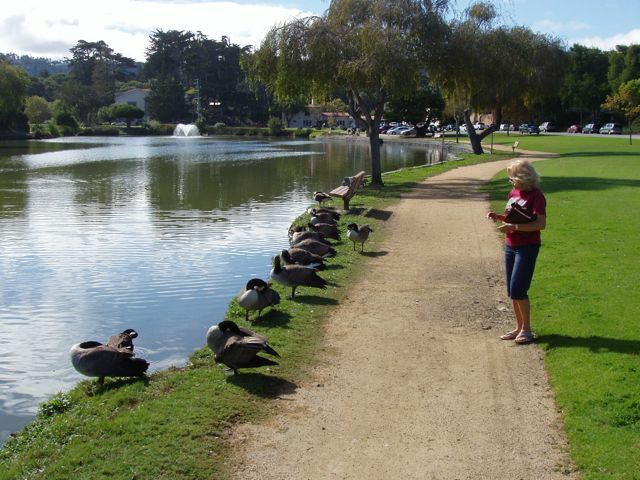 Conni converses with the visiting Canada geese. They only SEEM to be unresponsive! Of course, most people associate Monterey with Nobel Prize-winning author John Steinbeck's "Cannery Row" and "Sweet Tuesday". Rightfully so! 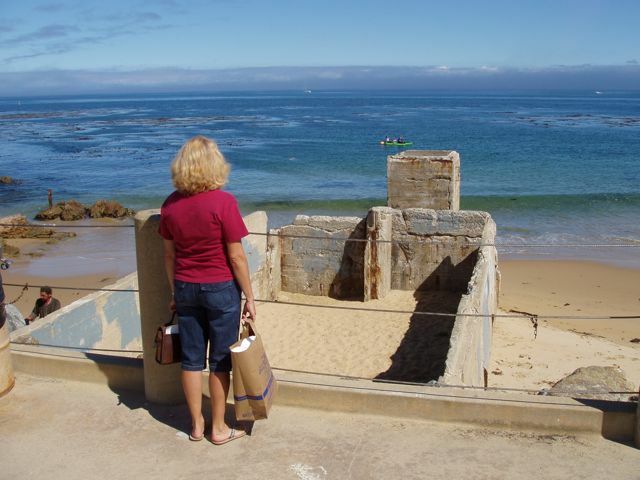 Conni enjoys the ruins of a cannery on the beach. We had already visited the local West Marine: note shopping bag. We enjoyed an iced coffee at a public square overlooking this lovely restaurant. Behind is a now-exposed beach that was the previous home of a now-burned cannery. Monterey Bay. Note the tops of the kelp forests. This beach is one of the best shore-diving beaches in California and provides those National Geographic views of sea lions, otters, and fish navigating through these kelp forests. The kelp can grow ten inches per day! 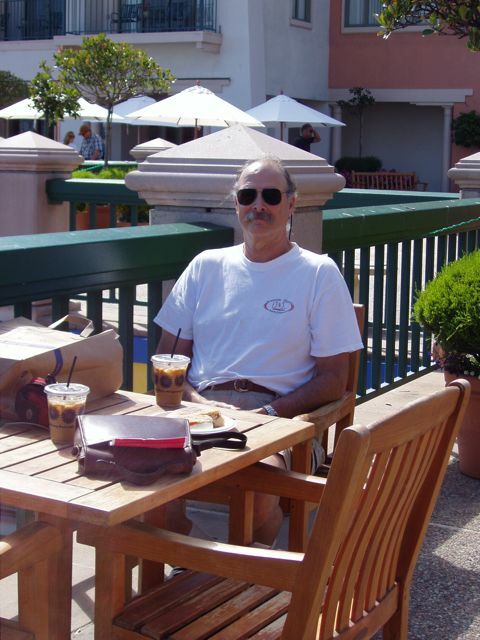 Bill is enjoying his iced coffee and panini while sitting at this public table. A brass plaque declared that purchases were unnecessary. Love that CA mentality! More ruins of canneries, here with a lovely mural of a fisher in his boat. 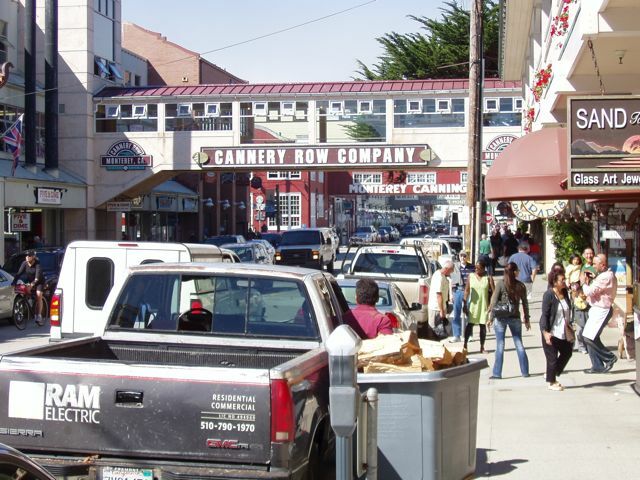 Cannery Row! The iconic "crossover" originally housed conveyer belts that carried empty cans to the cannery on the water side, and returned full cans ready for labeling and shipping. 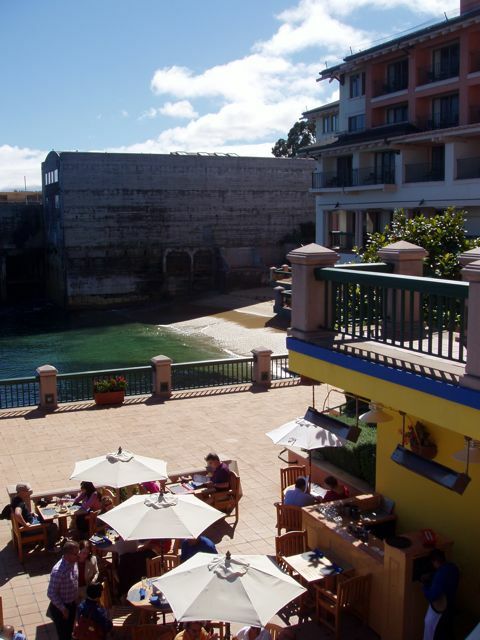 Many of the cannery buildings have survived and now house tourist-based businesses. 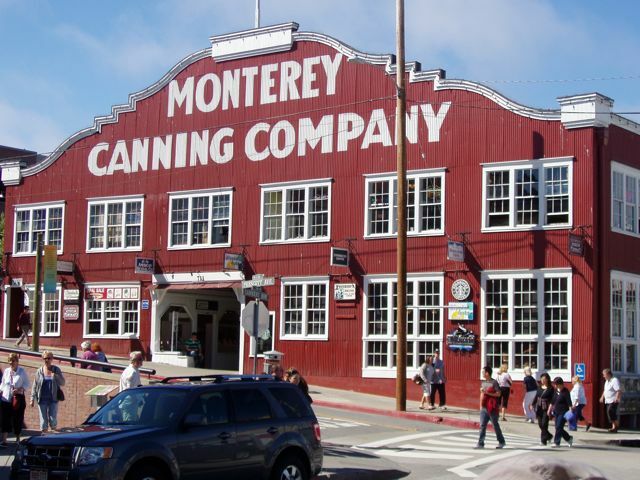 Now a home for several shops, this is one of the iconic Monterey canneries. 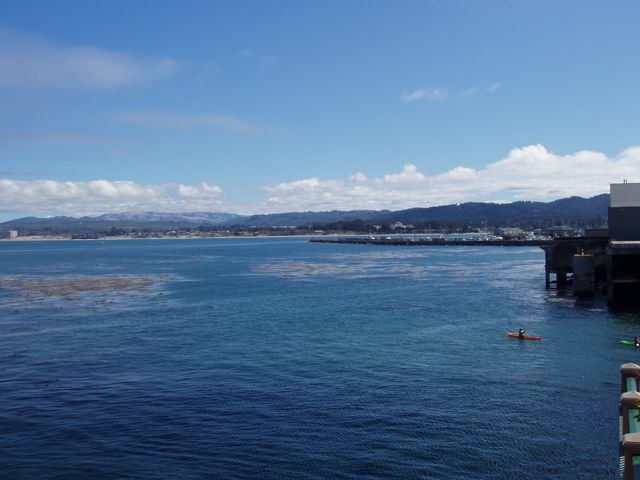 The Monterey harbor and marina as seen nearer Cannery Row. 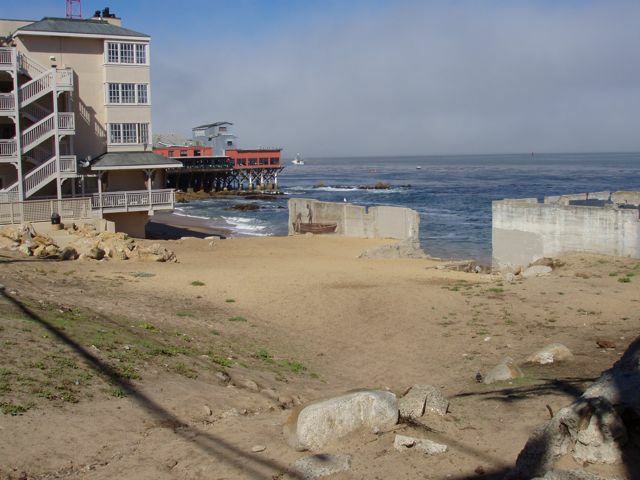 Behind this lovely beach is The Custom House, the oldest government building in California. 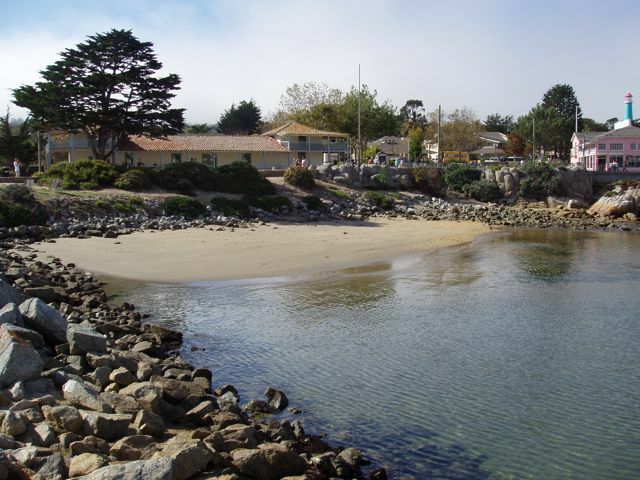 From 1822 to 1846, Monterey was both the capital city and primary port of entry in Alta California. On July 7, 1846, after the Mexican-American War, US forces raised the Stars and Stripes for the first time on a flagpole situated at the site of the one in the photo. America owned California!